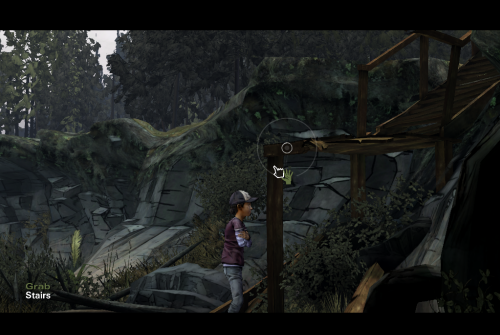 In The Walking Dead Season 2, you will be Clementine, the little girl who goes with Lee in Season 1. The following tutorial will walk you through the game and help you find all the items you need. 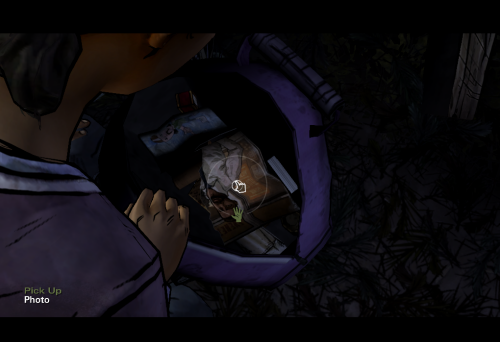 This is part one of the walkthrough and contains the majority of the items from Chapter 1 to Chapter 6. 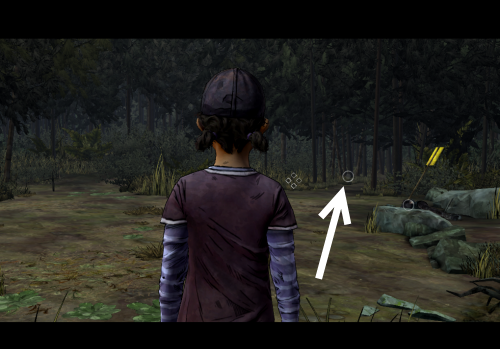 There is no “correct” way to play The Walking Dead. Each decision you make affects the gameplay. This tutorial will not tell you which decision is right or wrong, but it will help you find the items or ways to get things done so that you can get to the next part in the game. Spoiler Alert! 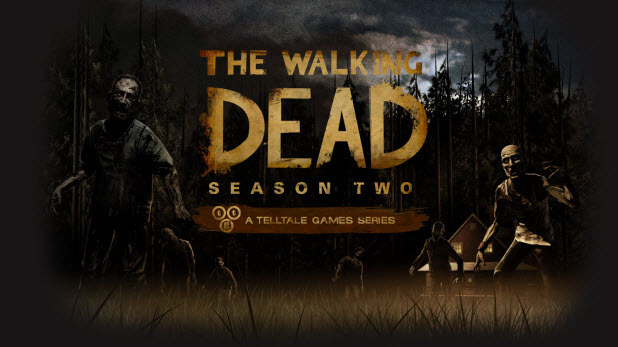 This post contains game information about the plot of the game. 1. 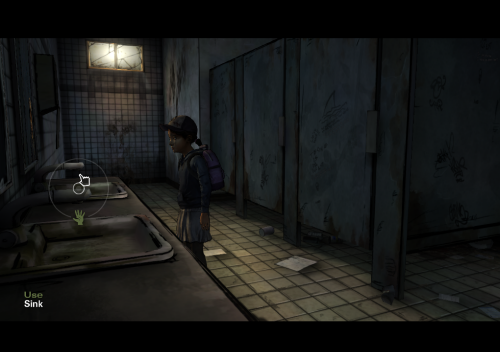 The game starts when Clementine, Omid, and Christa go into a public toilet. 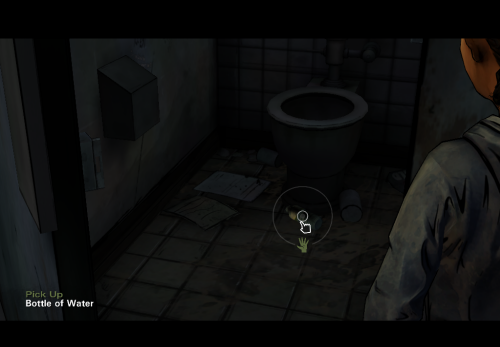 As Clementine gets in a room, she will need to check all the stalls to make sure that it is a safe place. Go ahead and check all three stalls. When she is done checking the stalls, guide her to the sink, and use it. Clementine will drop the bottle to the ground as she cleans her face. You will need to find it before the next scene happens. The bottle can be found in the third stall. 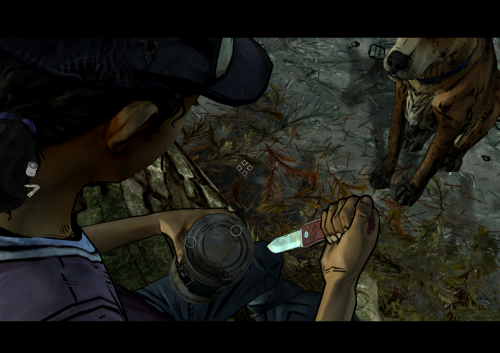 After picking up the bottle, Clementine will be threatened by a black woman, and the tragic story goes on from there. 2. 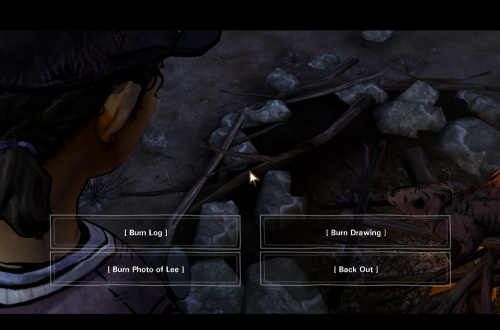 The next scene starts 16 months later, when Clementine and Christa are in the forest trying to burn some wood to grill the pig. Christa will go looking for more wood, and you will try to light up the fire. While waiting for her, you will need to light the campfire. First, open your bag, and you will find a lighter after picking up Lee’s photo and your own drawing. Next, pick up the log, and throw it into the campfire. There are some other objects in the scenes, but they cannot be burned. When you try to light up the campfire, choose to burn the log. Save the photo of Lee and the drawing as you may need them later. 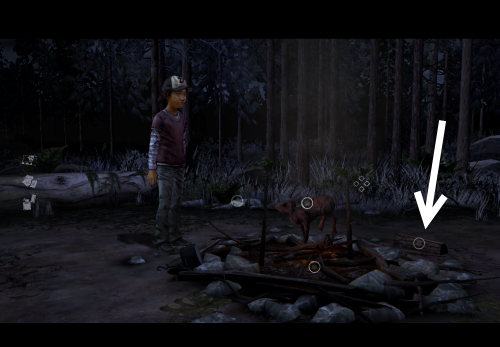 As soon as you light up the fire, you will hear the voice of Christa. She is being threatened by a group of people. From this point, you can continue with your own decisions. 3. The scene starts when you wake up by the riverside. Walk toward the path until you find the broken stairs. Climb up the stairs to get to higher ground. When you are on higher ground, walk along the path until you find a dog named Sam. He will lead you to a camp. After these long days, Clementine feels hungry. You will need to find some food before you can continue. 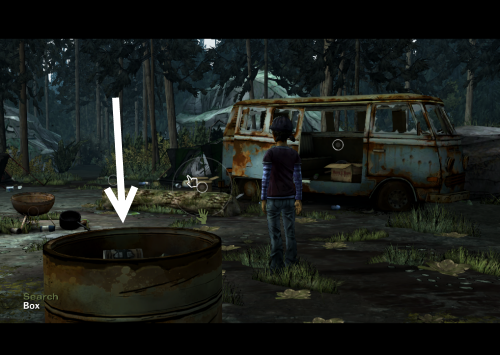 The trash barrel contains a bean can that you should collect. In order to open the can, you will need to find something sharp. 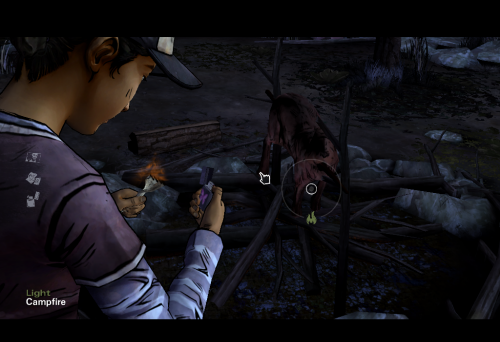 As soon as Clementine picks up the bean can, the dog will start barking. 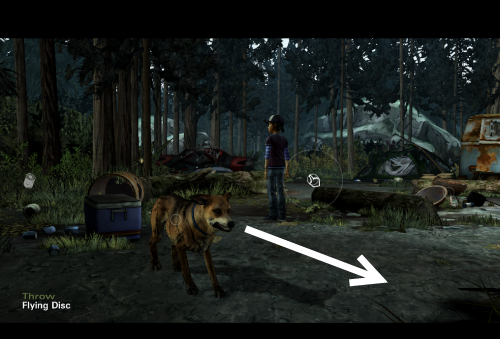 Follow the direction where the dog is barking, and you will eventually find a zombie. 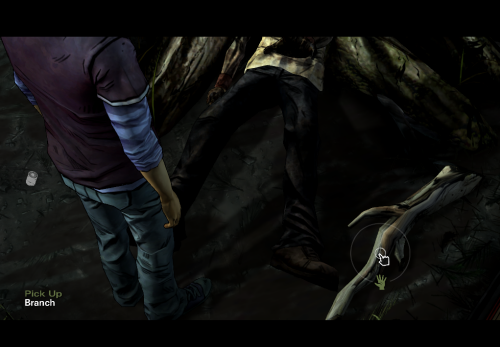 The zombie is tied to a tree, so it cannot harm you. 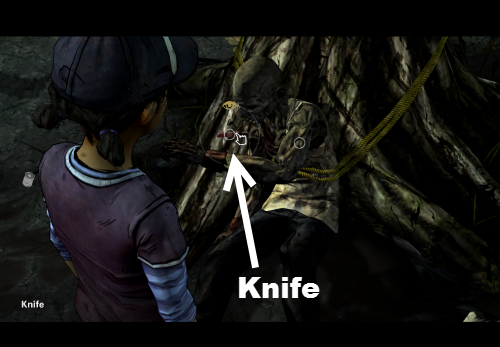 You will notice that there is a knife on its left chest, but it is too dangerous to get the knife when the zombie is still alive. Look on the ground, you will find a tree branch. Use it to kill the zombie, and get the knife. After that, come back to the camp to eat the food. From this point, you can continue with your own decisions. You are ready to continue your journey through the rest of Episode 1.